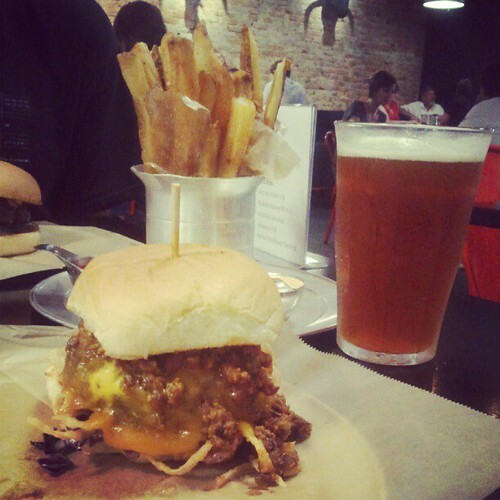 Started the trip off right with a half-way overnight in Raleigh and burgers at Chuck’s. Seems that we’ll never get to Poole’s Diner no matter how hard we try (our last trip, Poole’s stopped serving food by the time we stopped in and they were only open for brunch on Sunday, not Saturday like someone had mentioned). Since Poole’s was closed on Tuesdays, we decided a sister restaurant wasn’t a bad idea and, let me tell you, it was a stellar one. I scarfed down The Dirty South Carolina: Smoked Pork Shoulder & Anson Mills Sea Island Red Pea Chili, Crispy Tobacco Onions, Roasted Tomato Slaw, Ashe Co. Mtn Cheddar, Yellow Mustard. Oh, and a half pound of Belgian fries with all kinds of awesome dips to split. It was a monster of a burger. And one of the best I’ve ever eaten. Definitely hit up Chuck’s. Definitely get the Dirty one. Definitely do it for the Sea Island Red Pea Chili. It’s a doozy in all the right ways. 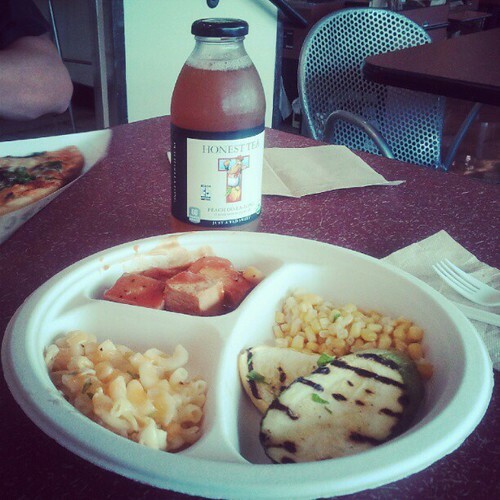 The next morning, we drove over to Whole Foods and loaded up on beer and munchies and stuff to grill at the beach and I indulged a veg-tastic plate of BBQ tofu, mac n’ cheese, Mexican corn, and grilled squash. 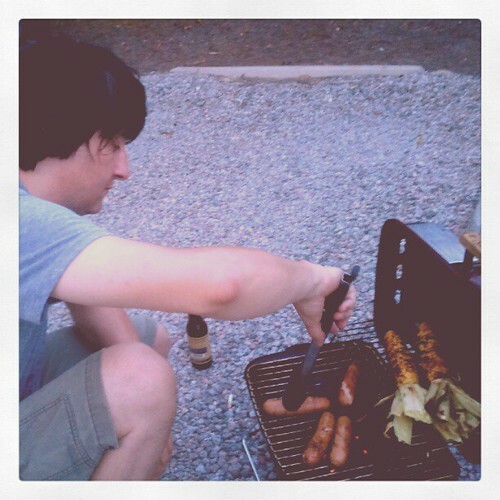 My kind of Fourth of July food fo sho. 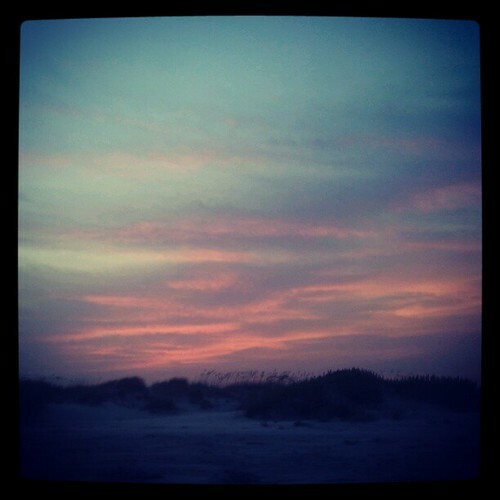 Then finally, Sunset Beach & the all too awesome Sunset Inn. 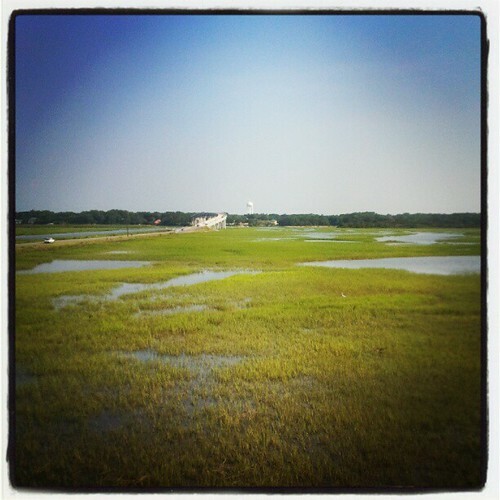 I really love that place, if only for the marsh-side porches, comfortable beds, and all-over quietness of it. It’s a place to relax. My kind of place. 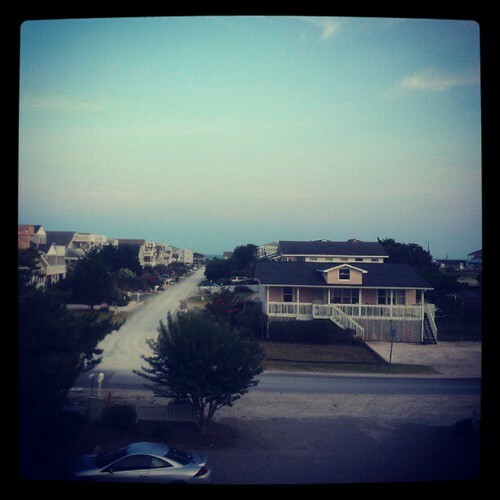 The view is from the front looking towards the beach, two blocks away. Perfect patch of blue on the horizon. It ain’t the Fourth of July without grilling though, and while we may not have had the perfect set-up, we were given permission to grill in the gravel driveway at the inn. Garlic knockwurst and Whole Foods’ prepared spicy lime corn and potato salad from home made for the most awesome first meal on the island. Totally worth hauling the camp grill from home for. Oh, hey, but we’re here for the beach aren’t we? 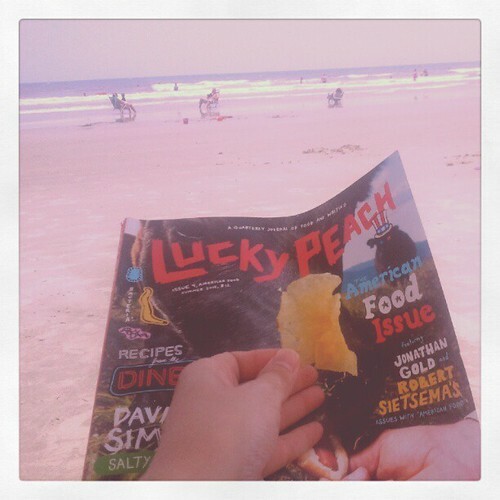 I couldn’t have been happier–stuff to read, beer to drink, shade to lounge under (beach umbrellas are so worth it), an ocean to jump in. 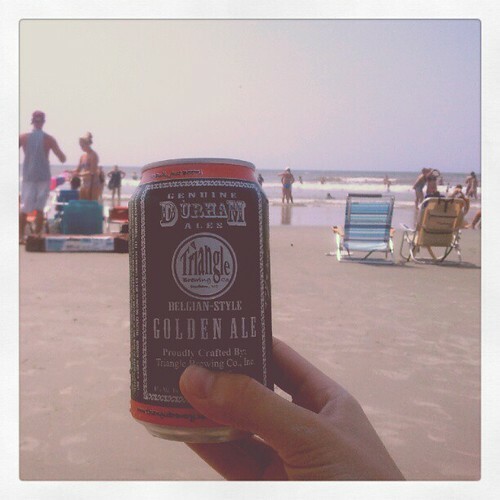 It’s my kind of vacation. I mean, I’m all about doing things & adventuring, but life’s been pretty stressful in various arenas. Nice to get away from it and be lazy. 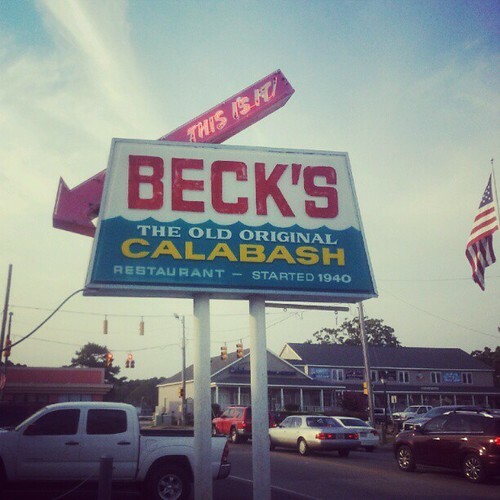 Other quintessential beach eats included a trip to Beck’s in Calabash–a seafood diner established way back in 1940 that’s still hopping today. 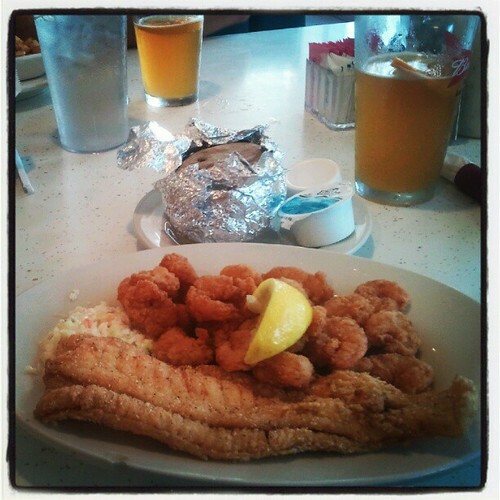 I ordered the local flounder and shrimp “Calabash Style” (lightly fried was the description) and it was good. Not spectacular, but standard friend seafood with a hard to beat diner vibe! While sunsets can’t feed you, the Sunset Inn will, and one of the best parts of the Sunset Inn is definitely its breakfast. It’s nothing fancy, but between 8:15 and 10:30 you’ll always find gluten-free quiche, a sweet bread of the day, bagels/English muffins, cereal, fresh fruit, yogurt, oatmeal, and probably some other things I’m forgetting. Coffee and OJ of course (or tea if you like). 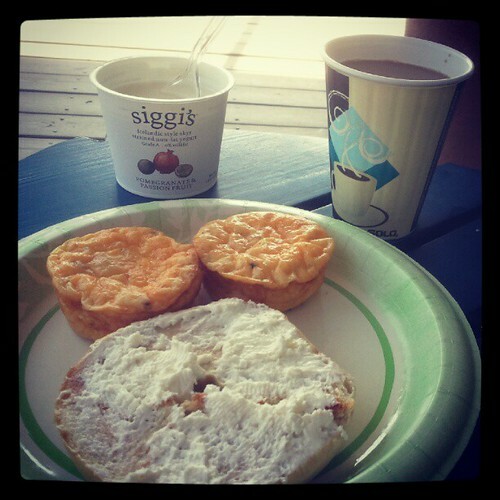 I brought the Siggi’s with me (the Inn isn’t that hip yet), but we were told that they always offer vegetarian quiche and will even accommodate vegans staying at the Inn with vegan waffles and the like. Way too cool. One afternoon found us back at an old favorite, Sharky’s on Ocean Isle, for drinks next to the water. It’s always time for a margarita, especially if the Jimmy Buffet station is playing. Oh, and the cat that belongs to the cat house (a picture I took last year) was actually wandering around on the deck! I got some good pets with it, but the phone was in between batteries, so no picture of the cutie. Another riff off of last year was our quest for German food. We ended up at an Austrian restaurant this time, but it was 100x better than our experience in Wilmington, so there’s nothing to quibble about nationality-wise. Cafe Old Vienna is a cute, small strip mall restaurant that packs in a ton of great service and flavors to the dining experience. 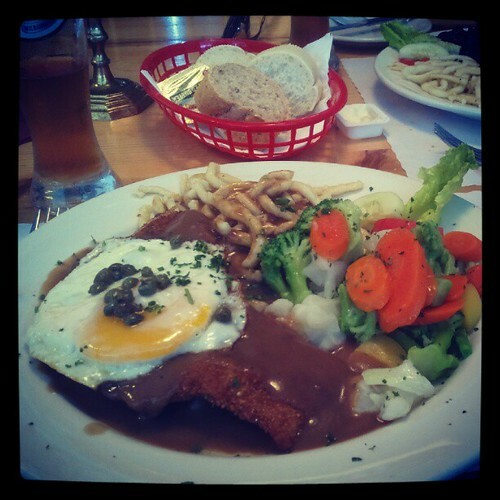 We each ordered a schnitzel and I couldn’t help but go for the the Farmer’s Schnitzel which featured gravy, capers, and a fried egg. With spatzle of course. Hands down I’d pick this restaurant over the one in Wilmington–bright & airy, you can tell it’s run by a younger couple, and the food was killer. Our starter of garlic potato soup was creamy and rich with garlic and even the salads were incredible–romaine, carrots, cucumber, tomatoes, bacon, and almonds in a tangy mustard dressing. Really really good all around. 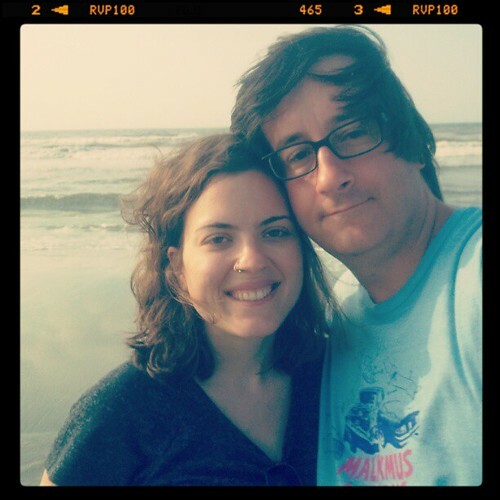 And, finally, rounding off the trip was a stop in Wilmington on our way home to meet up with Chrissy of The New Me for lunch. 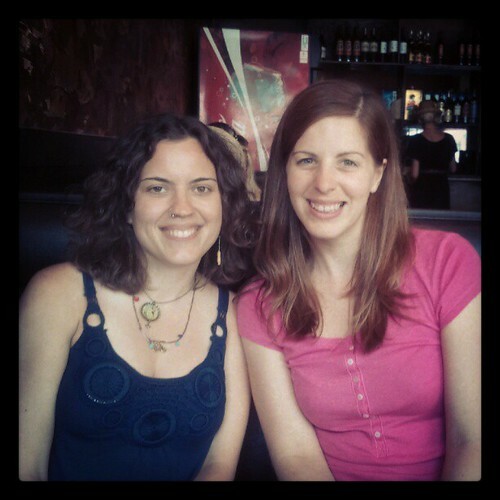 Love me some blogger meet-ups! It’s always awesome to meet someone in person that you’ve been in conversation with for years and this time was no different. Maybe a little less awkward of an invitation–since Chrissy lives in Wilmington it wasn’t as much of a stretch as it was for Monica who rode the train up from her village to London–but an equally good time! 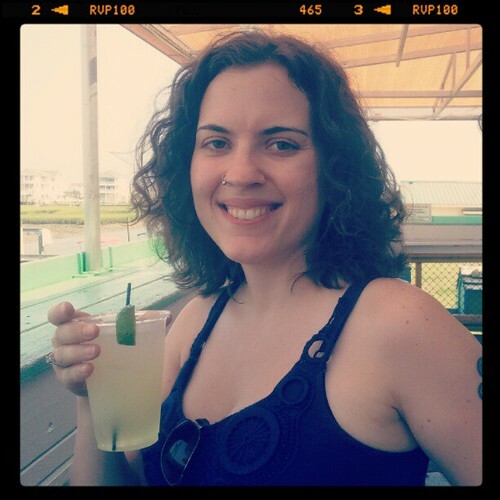 We chatted about writing programs–Chrissy just finished her first year in Wilmington’s MFA program–homesteading, gardening, and food, and it felt like I’d known her for ages. I know Wilmington was the right place for her, but I can’t help but feel a little twinge about how she almost ended up in Roanoke going to Hollins, the program I graduated from. Would have been amazing to have her in town! 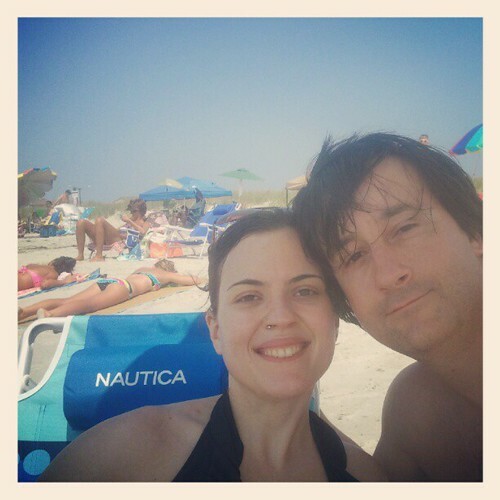 I’ll settle for beach meet-ups though–a good excuse for a tan and conversation! We met up at Nikki’s Sushi Bar in downtown Wilmington–a little sushi place that also offers rockin’ vegetarian, vegan, and omni sandwiches. 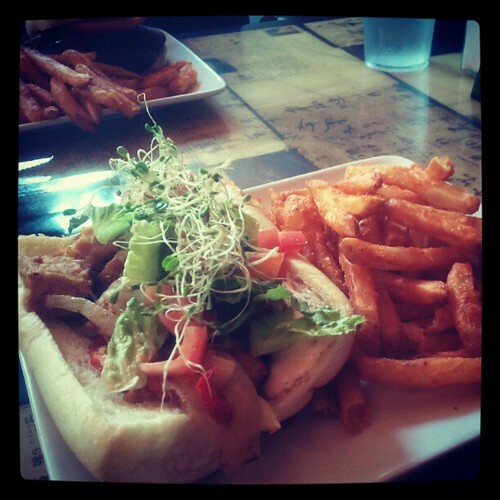 I ordered the Tempeh Philly which featured fried tempeh topped with grilled onions, peppers, mushrooms, lettuce, tomato, sprouts & chipotle salsa mayo. A little weak on the chipotle salsa mayo oomph, the sandwich was really good overall and I loved being able to mow down on some vegetarian fare after our coupe of days of beach bumming indulgence. And thus the end of our mini-vacation. Felt like we packed a lot in to just a few days (the holiday really helped–I only took 2 days off from work! ), but I feel a lot better right now about jumping back into life feet first and figuring out how to handle all the little stresses life throws at me. (Speaking of which, this blog on “The ‘Busy’ Trap” from Tim Kreider in the NYT really spoke to me–I mean, how easy is it to schedule up and forget to let go and live? I really need to meditate on this stuff, get back into my creative self and learn to relax a little more. Lots of thoughts on the article, no organization to them though….) Anyways, vacation. It happened. We had a great time. Now back to the grind–but maybe with a fresh outlook? Ah! You’re too sweet. I also had a really good time and was pleased at how easy it was to talk in person – sometimes I can be awkward without a computer screen to hide behind. 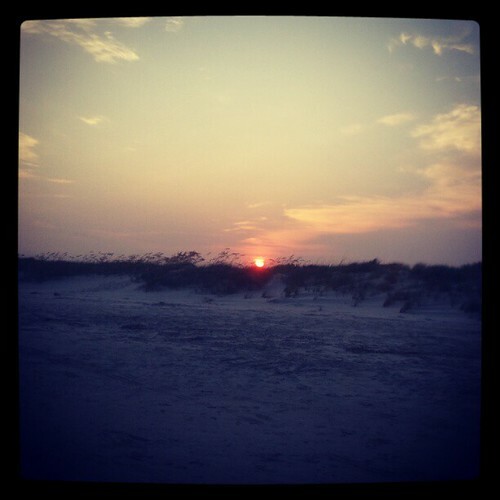 And if you come through Wilmington again (Sunset Beach 2013?) we’ll have to have another lunch date, and this time I’ll make sure Nathan gets his homework done in advance. it sounds like you had a fabulous time! and with delicious eats! Sounds like a perfect summer getaway! 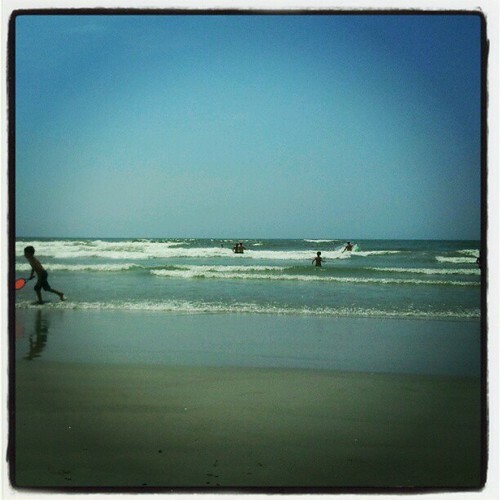 I really, really, really need to get to the beach. And I’ll keep Sunset Inn in mind if we are ever inclined to hit a NC beach – the only problem with family living 5 minutes from the beach (in SC) is I only ever end up going to the same beach (which I love, but change is good too!). Wow, what a wonderful vacation! 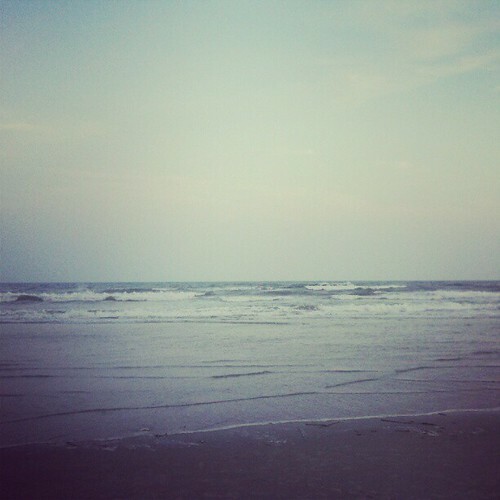 Kind of makes me a little nostalgic…I grew up not too far from Wilmington and the beach. And I miss all that fresh seafood. Still like the mountains better though. Your pictures were really cool…so retro. And those are really pretty shots of you. By the way, I don’t blame you a bit for liking the Smartphone. Somebody recently showed me an app on theirs that could take a picture of a bird you see and identify the bird for you fairly accurately. I’ve got to admit that I found that pretty amazing. Funny thing…my daughter just sent me a link to that same NYT blog piece on busyness. I agree with you…it was very good. Not to worry about not having your own picture-distorting-device – some of us like to see what was there.